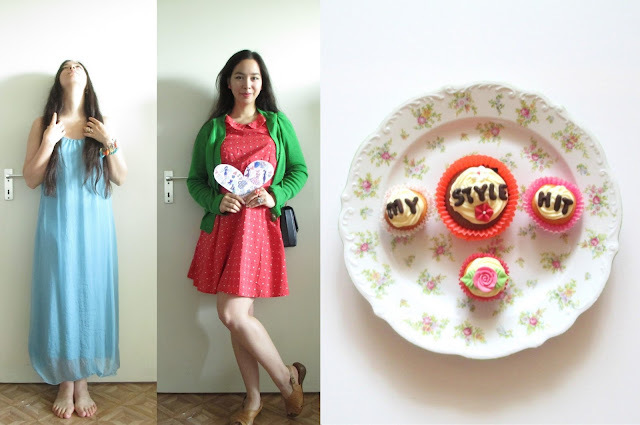 Strangeness and Charms: OUTFIT: i ♥ mystylehit. since 2 months i'm an excited member of mystylehit.de, a great community, where you can see outfits with the compatible styles with pieces you can also instantly shop in onlinestores such as zalando, mango, ASOS and H&M. you can also post your personal outfits and styles. if you're a blogger, you can participate in the VIP blogger program and receive points for every activity you do in the community and with these points you'll receive presents, gift vouchers, etc. there's also a job market with cooperations for bloggers. at the moment there's a challenge on mystylehit.de - every blogger is called to translate the theme 'i love mystylehit' in a creative way. we can do handicrafts, dance, draw, crochet, sing, bake, sew, rap, film, knit, puzzle, cut out, cook etc. ... i wanted to create a compound of two of my favourite topics - fashion and food art. and thus i created this collage. Danke für deinen lieben Kommentar und die Verlinkung!